That’s how you take care of business against the Orioles. After losing two of three to the Orioles a week ago, the Yankees swept the will-be last-place team this past weekend. Now at 5-4, the Yankees aren’t where I thought they would be following nine games against the Orioles and Tigers, but they appear to be headed in the right direction. 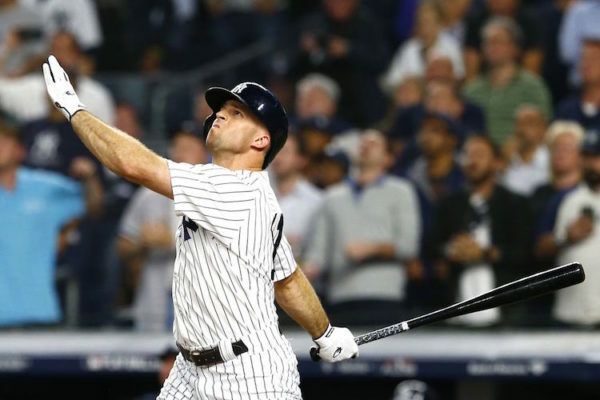 This week’s questions and comments are heavy on Aaron Boone and then there’s the problem with who leads off and why the Yankees didn’t take advantage of the best free-agent class ever and possibly the last star-packed free-agent class ever. No, I didn’t want Aaron Boone to be named the manager of the Yankees prior to 2018. At the time, I thought the Yankees did the right thing by replacing Joe Girardi after 10 years, but had I known the first 176 games (regular season and postseason included) would go the way they have, I would have preferred to just retain Girardi. Despite winning 100 games last year and the wild-card game, Boone didn’t do a good job. Winning 100 games isn’t much of an accomplishment in a season in which two other American League teams did the same, in a season in which five AL teams lost 89 games or more. The same goes for this season. Which teams are really trying to win in the AL in 2019? The Yankees, Red Sox, Rays, Astros, A’s and Angels? Every other team either shed payroll, tried to move their star players to shed payroll, failed to sign any worthy free agents and basically went along with the idea that it’s more profitable to lose than win in baseball’s current state. This season, Boone has once again gotten off to a rocky start, either unable or unwilling to make changes to his in-game management and actual baseball strategy to improve. Yes, the Yankees have an unheard of amount of players on the injured list, including four of their everyday players, two-fifths of their rotation and their best reliever. But that doesn’t excuse some of the moves Boone has made in the season’s first nine game. None of the simple decisions he could have made were related to the team’s injury problems, rather they were basic baseball moves. I don’t trust Boone. This team is going to the playoffs in some capacity, and I’m petrified another year will be wasted because of his bullpen management. Boone helped throw away the ALDS last season and he has six months to get this team back there and then manage the way he’s expected to once they get there. I won’t count on him pushing the right buttons until I actually see him to do it. I also don’t think Willie Randolph is the solution and I don’t think he would ever be considered for the position in the future either. It’s pretty ridiculous. The Yankees had two off days after their last exhibition game, played one game and had a day off, played five games and had a day off. And oh yeah, they basically had six months off before all of that. It’s unclear why the Yankees believe they have figured out who needs days off and when they need them or why they truly think they have the solution to preventing injuries and maximizing performance. The team currently has more players on the injured list than any other team in baseball and they haven’t won anything in a decade. No, I don’t think Judge was referring to Boone with his words, but he should have been. Judge was simply frustrated with all the men left on base and the errors and sloppy play from the team in the second game of the season. After coming within a win of the World Series in 2017 and then being embarrassed last October, I’m sure Judge is sick and tired of not getting the job, the way the fans are. Given that it was his gesture which turned “New York, New York” into the Red Sox’ victory song after their ALDS win, I’m sure he wants to erase that backfire as quickly as possible. The way the Red Sox’ destroyed the memory of the 2003 ALCS by beating the Yankees and winning the World Series the following year, the Yankees can erase the embarrassment of the 2018 ALDS by winning the 2019 World Series. The easiest way to win the World Series is to avoid the one-game playoff and win the division. So Judge’s urgency makes all the sense in the world. The division will be won by which teams beats up on all the crap in the AL. The Yankees have to do a better job than they did last season against the last-place teams. I tend not to put too much stock into what the hitting and pitching coaches do, though I believe the pitching coach is more important than the hitting coach. The only hitting coach I ever really cared about or paid attention to was Kevin Long because he seemed to get all the credit whenever a player performed well, and was of any criticism when the team didn’t perform. The Yankees could have done better this offseason. They could have signed one or both of the 26-year-old generational stars or the best pitcher on the free-agent market. Instead, they spread the money out after getting under the luxury tax and paying all their core players close to league minimum. It was an odd offseason plan and considering all young star players are getting long-term extensions, it might have been their last chance to ever make a significant difference through free agency. I believe the Yankees missed an enormous opportunity to lengthen their current championship window and put the best possible team on the field. No, they don’t necessarily need any of the Top 3 free agents to win the World Series, but it sure would have helped. Brett Gardner has actually been better over the last few games since this question/comment was written, but that doesn’t change the fact that he should never lead off on this team. I hate to get on Gardner because this whole ordeal isn’t his fault. He didn’t offer himself the one-year, $7.5 million deal when there were better options to take his place. And he’s not the one penciling himself in as the leadoff hitter every game. But I need to know who is. If it’s Boone, it’s strictly incompetence for a manager whose only redeeming quality seems to be that he’s a good buddy for the players. If it’s the front office and analytics team, we have much a bigger problem. The Yankees are driven by analytics and if it’s somehow analytics recommending Gardner as the leadoff hitter then find new math guys because any person, stat or formula saying Gardner should be at the top of the order can’t be trusted. We can’t have someone who creates an algorithm suggesting Gardner bats leadoff on this team also determining which players to target in trades and in free agency free agents the Yankees should target. But Maybe that’s why they passed on Manny FA and Corbin. Maybe it was the stat guys telling Boone who to bring in with the bases loaded in Game 3 of the ALDS. Either the Yankees have a manager so far in over his head despite having a season under his belt or they have an analytics team which needs a complete overhaul and either way it’s a problem.